Don’t feel like cooking because its too hot? Then here is something you can rustle up quickly which is healthy and still so delicious and looks pretty too ! Start by preparing the tomatoes. Slice in a cross but do not cut right through and gently open the ‘petals’ so it will later house the couscous. Set aside. Break the cauliflower into big chunks and put into a food processor along with basil, mint, parsley and garlic. Pulse several times until minced. 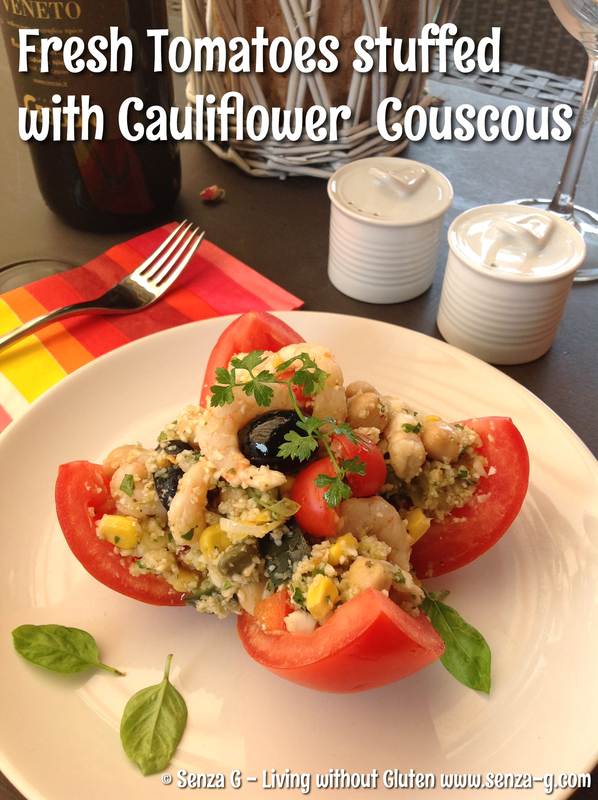 The cauliflower will have a granular texture – much like couscous. Set the cauliflower aside in a big bowl. Add the remaining ingredients to the bowl and combine well. Pour in the olive oil and add the spices and seasonings and again combine well gently. Take spoonfuls of this mix and place in the tomato cups. Garnish with black olives or cherry tomatoes and parsley. Drizzle with some Olive Oil if desired.